DK is well known for their interest in creating some of the most fascinating books you will ever read. Not only is this book filled with full-color maps, it is also illustrated with contemporary and archival photographs and artwork. The features include: Entries organized according to dates and geographic regions, beautifully illustrated timelines, feature boxes and captions, cross-reference navigation tools, introductory narrative for each timeline, encyclopedic Subject Index and Glossary, comprehensive information on the arts, science and technology, exploration, philosophy and religion. The sidebars are used for detailed captions and additional chronologies. I also loved the "snapshot" maps where the pages fold out and you can see how the world evolves over time. You can visually compare the world in 1000 BCE with the world in 1975. The quick reference timelines at the start of each chapter shows the most important events of that time period. How is this book set up? As you read through this book you will find four columns: Asia, Africa, Europe and Americas & Australasian. ASIA: 2002 Musharraf wins Pakistan general election. AFRICA: 2002 The threat of famine looms large in Zambia, Zimbabwe, Angola, Mozambique, Swaziland, and Lesotho as crops fail due to droughts and floods. EUROPE: 2002 Single European currency – the Euro-introduced in 11 of the 15 EU Member States. AMERICAS & AUSTRALASIA: 2002 Estimated Internet users worldwide 530 million. On each side of the four columns, you will find pictures with information on the Conflict in the Middle East, Asylum-seekers in Europe and a summary of Sept 11. While it doesn't seem much is going on in the Americas and Australasia until page 249, you have to see this all in context. Often this area is filled with pictures, so the space is not wasted. Basically the timelines show what happened and when. It is that simple. This book spans from 10,000 BCE to 2002. For instance, you will find entries like: c.1000 Adena culture develops in middle Ohio river valley in eastern N America. Things start picking up after pg. 271 when Christopher Columbus makes his appearance in search of Asia and lands on the Bahamas on his first expedition. The United States of America is not a big section of this book, simply because it is a young country in comparison to countries in Europe, Africa and Asia. I say all this to put the information in this book into perspective. It does seem that the editors went out of their way to include as much information as they could before the 15th century. Concordance – This goes from page 458-666. I find it interesting that this book has 666 pages. The Concordance section of this book is worth the price alone. It is a collection of major events, brief biographies of key historical figures, lists of major rulers and leaders, individual chronologies of each of the world's nations and also acts as an index and glossary for the book. If you are researching "Plato," you can look up his name in the alphabetically arranged concordance section and not only read about his basic philosophy, you will also be guided to page 59 where you will the date of 384 where he wrote his philosophical dialogue, The Symposium. If you look up United States of America, you can find all the important dates like 1776, followed by a list of the Presidents of the United States. If you are interested in world history and want to finally organize your thoughts into an historical context, you will love this book. I think of this as a History Dictionary/Encyclopedia of sorts. If I need information on any topic, from Microsoft to Buddhism, this is a great place to start and I can then put all the topics I’m researching into the proper historical perspective. This is a good sturdy book with a beautiful binding. A book you will be reading for years and years! I found it to be very reliable and all the facts I knew by heart where listed correctly. Sadly, the author, John B. Teeple, passed away in the Spring of 2002 and tragically never saw this book in its published form. There is a foreword from the author and it beautifully explains why this book was written. 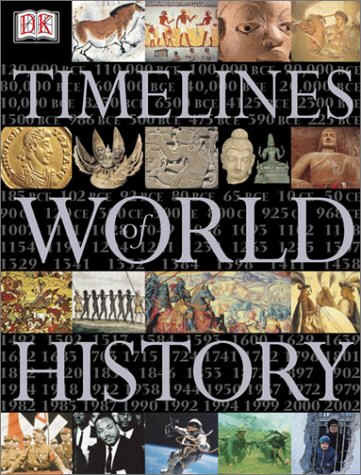 "Timelines of World History" is Mind Boggling! It is another DK masterpiece. If I could, I would give this book 20 stars. 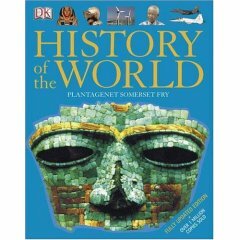 The History of the World is now completely updated. Simon Adams has continued the work of Plantagenet Somerset Fry (1946-1996) and has worked on this book with a number of consultants who have helped to make this book truly spectacular. Some of the unique features of this book include color-coded information that is divided into five main regions: Africa, Asia, Europe, the Americas and Oceania (Australasia, Papua New Guinea and the Pacific Islands). Date-led entries provide interesting details about significant developments in the world. Artwork and modern pictures help to give a visual reference to the key events pages. There are special feature pages to give a space for descriptions of the culture being discussed and the "illustrated comparative time charts" put the information into perspective in a chronological order. As you read through the book, you can watch the world change and the pictures give a glimpse into the past, like the partially restored Minoan palace at Knossos. You can learn fun things like facts about the Inca's Freeze-dried potatoes and there is a picture of a potato that is 500 years old that was being preserved in case of a famine. Imagine having to remember how to read information from a string called a quipu instead of writing. Population density maps give a better idea than numbers, a special section on inventions and discoveries shows progress and a comprehensive index and helpful glossary make this book even more useful. Information about beaded amulets sewn back in the 1800s helps to explain why they are still popular today in bead stores. The history of buildings page shows the endless variety of creative expression. The lacquered and beaded items are especially fascinating in this book. This book can also be fun to read if you are just wandering around this site. I looked up a Persian fruit bowl and ended up finding some rose scented candles and beautiful china patterns. A search for a Ming Chinese food dish brings up a book about Chinese Medicine. It is very likely something in this book will cause you to search for more information or you will enjoy recognizing scenes from movies or world events. While reading this book you take an epic journey through time and suddenly history becomes much more interesting with all the special features and unique illustrations. Have you ever found yourself thinking: "Where in the world is that?" When faraway places make headline news, it is helpful to have an easy-to-navigate Atlas to quickly locate areas of interest. There are especially helpful elements in this Atlas, like orange markings around Islands help to group them together and all borders are shown in Orange, which may be even more helpful if you are traveling. The Key to Map Symbols is easy-to-understand and soon you get a feel for elevations. The color-coded areas make finding continents especially helpful, without even looking in the index. At the end of the book, there is a section filled with "Country Profiles" with information on pertinent information like the official name or main religions and languages. Population, total area, currency and Government information is pretty interesting, but now you can even know the average calorie consumption in all the countries. This is the smaller Atlas and is helpful for quickly looking up information. 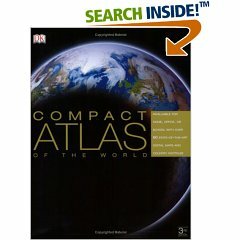 If you want to see all the countries in more depth and explore culture and see photographs of the areas, then the Concise Atlas of the World has over 400 digital maps and is the perfect desktop reference edition. DK History of the World is also highly recommended.